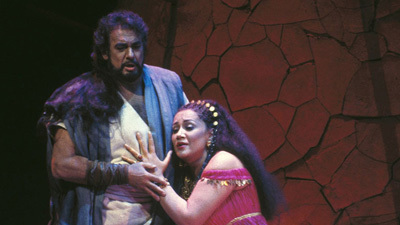 This Biblical tale of the overwhelming love between a Jewish leader (Samson) and a Philistine beauty (Dalila) that turns sour and destroys them both has inspired numerous composers. But it’s easy to see why Saint-Saëns’s opera has remained a favorite—not only with audiences but also with great singing actors. Seldom has Dalila been so sultry and seductive, or Samson’s fall from strong man to blind prisoner been so wrenching. With enticing Risë Stevens and heroic Mario Del Monaco in the titles roles, and Martial Singher as the High Priest, this stunning performance is a true gem.